Banks raised their forecasts for oil prices for the 10th successive month in July amid anticipation of less Iranian crude and declining global inventories, factors that have already boosted the market this year. Brent crude is expected to average $73.65 a barrel this year, according to a poll of nine investment banks surveyed by The Wall Street Journal. West Texas Intermediate, the U.S. standard, is projected to average just above $68 a barrel. Both estimates mark increases of roughly $2 on the forecasts from June’s survey. Oil market feels "firmer rather than softer" for the rest of the year, BP's Bob Dudley says...So, price will rise? New threat for oil price market. Iranian forces are expected to launch a naval exercise in the next 48 hours that may show their ability to shut down the Strait of Hormuz, US officials say, according to CNN. This won’t help in any way to create a positive environment to resolve the actual crisis. More worrisome is the fact that the Iranian regime seems to believe their own myths of being capable to stand up against the U.S. and allies in a military confrontation. OPEC’s crude output increased last month as Saudi Arabia pumped near-record volumes to make good on a pledge to consumers that demand would be met. The kingdom’s oil production grew by 230,000 barrels a day in July, to 10.65 million barrels per day. 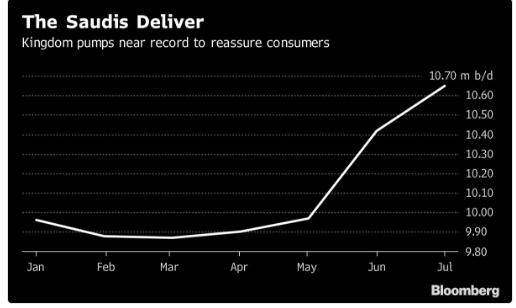 This is just shy of an all-time peak reached in 2016, according to a Bloomberg survey of analysts, oil companies and ship-tracking data. There isn't a navy on the planet who can stop the US if we really want to keep a straight open. If we really wanted to, we could decimate entire countries with impunity. If someone tries to disrupt oil supplies, we could hold down prices with the SPR until they've been swatted aside. How, exactly, is Iran a threat to oil flows? We all know the US could "decimate" entire countries. 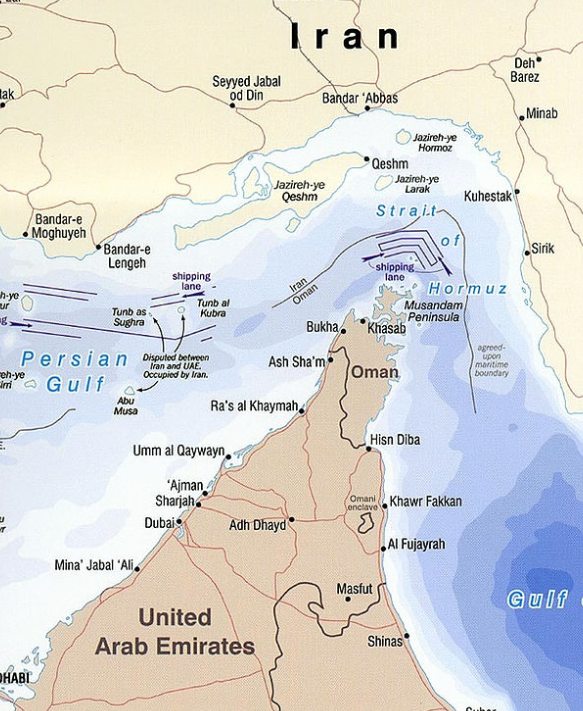 The issue with the Straight of Hormuz is that if Iran can get a naval jump they could place mines etc. Even the perception of such would have to initiate a clearing/sweeping process that could take weeks/month. At what? 18 million barrels a day going through the Straight I think even days could be extremely bullish for oil. I also believe trying to hold down prices with the SPR won't really be effective in the long term. If the US has to make up for even a quarter of that... 4.5m boed is a significant amount of draw down, which even then may not be enough supply to keep the price contained. If it does hold the price down for a brief period of time I believe it will just constrict the market even more in the future. If Iran gets decimated, their production will be negligible for years, and by drawing down the SPR it leaves even less supply for future disruptions. I think both of these scenarios are bullish for oil. Missiles technology has advanced at a rapid pace. This makes the cost of projecting power far more expensive. While Iran does not have the technology of Russia, China, or India (who have been working together for 2 decades on missile technology) technology that has relegated the US Navy into near obsolescence in relation to some activity that requires getting relatively close to land- Iran does have significant anti ship missile technology. It is not like we could just wander into the straights. Even with sustained bombardment it will not be easy to take out Iran's missile defence's. In the meantime there is little that can be done about the mines. With enough time we could pound Iran into submission but, we would sustain losses and it would take time for our forces to be able to get into the straights to clear the mines safely. My pleasure, although simply an opinion. The reason Iran shutting down the Straight could have such an impact so rapidly is purely because the amount of oil that goes through it daily. With roughly 1/3 of all sea born exports (20% of global supply) going through the Straight, even a day could be significant. Plus the general implications of what it would do geopolitically to a region that is a major part of global supply. I think the reason we're seeing a rally today is partially because of the news that Iran is currently conducting "naval excersizes" in the straight, from what seems to be out of no where. Up almost 2% today. Imagine if it actually happened. I have to ask one question: given that we have carriers, local air bases, trans-continental bombers, and 24/7 satellite coverage, would they be able to lay a significant number of mines before we stopped them - and would we not know the exact paths their mine layers had followed, making it easy to cordon off unsafe areas? Given how important this strait is to the entire world, I find it unlikely we'd allow them a credible threat. Thoughts? This video may add some clarity. I do believe the US and its allies would be quick to react, but politics and policy always adds some red tape to exactly how fast one may be able to proceed with counter measures. Also, it comes down to the owners of the tankers too, would they be willing to take on the inherent risk of passing through an area that may have mines as well as the Anti Ship Missiles Iran has ashore even if escorted. Additionally if the US had to de-mine the area to ensure safe passage I'm sure they would run into resistance from Iran adding longevity to what may be perceived as a simple process. I don't think many tankers would pass through an area where military conflict is even an immanent threat. Which it would rapidly become if Iran took any action in closing the straight. Mines or not. Look at Bab el Mandeb, one tanker had minor damage from a low level attack and KSA made the decision to not have any additional tankers pass through. I don't know how long it takes to lay mines, but to my knowledge the "Sea Lane" (the area that these larger tankers can pass through safely, depth, obstructions etc) is only 3 kms wide so I'd imagine with a good strategy, it wouldn't take too long, perhaps even a few hours. It's a catch 22. You can be preemptive to not allow them a credible threat, which will still result in turmoil and likely escalate Iranian retaliatory measures. Or you can wait and hope this is just posturing, which Iran has done multiple times before. From what I've seen I don't think US being the aggressor aligns with their general military strategy. To me the task for Iran is easy. Hit a couple of oil tankers going throught he straits at the narrowest point, 30 miles, with anti ship land based missles and sink them in the main channels. This closes the straits right away there is not enough sea room to get round them. It would take at least a month to clear meanwhile they could attack the ships trying to clear the sea lanes with thier mini subs or fast attack craft. Anyone think that is not a feasible option? 1) When we conduct military operations, we don't attack everything simultaneously; we start with the most important targets and systematically work our way down the list. At some point, the remaining enemy assets are tactically irrelevant, either from disorganization, fear, or physical inability to engage. Those targets can be annihilated at leisure. 2) The US military has fought every weapon wielded by every type of enemy in every possible climate and geography. E.g. the Marine Corps has been in active conflict more years than not since it's founding in 1775. As a result of this extensive experience, it's accumulated a vast body of knowledge and menagerie of special-purpose weapons. If there's a scenario, the US military has the doctrine and weapons to handle it. This dramatically decreases the time necessary to resolve problems. Given that the strait is less than 500 miles from the nearest airbases, the mine layers could be sunk in <2 hours. With cruise missiles available, these could be the very first targets. After that, systematically annihilate their armed forces: anti-air, command and control, anti-ship, surface fleet, submarine, and so on. Most likely, you wouldn't have to destroy all of them. Few armies continue fighting once they realize it guarantees death, fanatical statements notwithstanding. Iran wouldn't be a challenge; the only question is, "How quickly can the US and allies service available targets and sweep the mines?" Between air bases, allied assets, a carrier group, and heavy bombers flying in from around the world, I doubt their armed forces would last more than a couple days. That leaves the mine clearing. I don't know how long that takes, but if they only have hours to lay them and satellites track the laying, probably not long. This is a fairly well defined problem. All of that assumes Iran would keep fighting past Day 1. Iran's leaders talk big now, as most inexperienced people do, but my experience is that people change their tune once rounds start flying. If the leadership doesn't already know they're blustering, they'd figure it out once official comms went silent and all they had were sporadic reports of death and destruction. But they could shut down the strait for at least a few days. Let's be generous and say a few weeks. The US alone would struggle to make up the difference from our SPR, but we're not the only country with an SPR. Wouldn't the world cooperate to minimize the disruption - esp. Asian countries that have a lot to lose from high oil prices? If so, how much price disruption would we really see, and for how long? Would it really shut down Iran's oil production, or would we take that production when they sued for peace? Even if we didn't take the oil outright, would their dire straits not give them incentive to keep it flowing? A few days of war doesn't have to stop the flow of oil. It seems like the flow of oil would depend what was in America's best interest. The threat from Iran is presented as a scary unknown, but once the details are played out, it seems more like a quantifiable risk we've already hedged against. This is not a WWII existential threat; it's a fundamentally weak country making noise. An interesting country with many accomplishments to its name, but fundamentally weak nonetheless. It doesn't seem like much to get excited about. And yes, there would be other countries willing to contribute from their SPR but like I said, it would still decrease the overall available supply, as stockpiles would now be consumed. Fundamentally, that is bullish for oil long term. Especially when I believe the market is already pretty tight. I'm not sure the Asian countries that rely on oil from these areas have much to contribute if it came to adding supply as they are quite reliant on their imports. I think KSA and US would be the go and I believe KSA is tighter then they lead on. Also, if countries were to contribute, how fast could 18m barrels be redistributed and transported to the affected areas. With regards to long term price disruption, it really depends on what this may evolve into. Does it turn into a war, with KSA, Iraq, Isreal involved or is it as easy as putting a blanket on a fire. Never the less I do think the market will be affected. Considering oil has fluctuated up to 5% just based on the API numbers being off and the market reacts to whispers of tariff hikes, this would prove to be far more substantial. I agree, I don't think the issue or action it's self couldn't be remedied efficiently. But the geopolitical tension this adds to an area where a large portion of global oil comes from will certainly be reflected in the price. Personally, I think Iran is just doing whatever talking it can to inflate the price as much as possible. They need to get best price now with the exports they have before they are no longer able to export as much come November. I think it's about way more than could Iran physically close the strait. it's more about whether it would make sense for them to do that. Iran's neighbors would not sit idly by while Iran stripped the region of its income source. there would be pressure and lots of it, and not just from the US. most of that oil that goes through there is headed to Asia. yes, I suppose Iran could physically close it. For a few days. and then all hell would break loose. As for Iran permanently closing the straight like with a sunk tanker or two, this would be like shooting yourself in your own foot. Iran needs the strait open just as much as everybody else does. I think Iran wants to "disrupt" the Straight, not so much so, that it will lead to absolute hellfire, but enough to make a point. Similar to their training exersices today. Your right, I don't think they'll sink a tanker, they need the straight open, they just want to be the ones who control it (as temporary as that may be). They may fire at one or two, to fuel fears of more detrimental outcomes, similar to Mandeb, but sinking one is out of the question. I'm not sure about the pipelines, unless Iran can keep it closed for a significant period of time or sink multiple tankers, to the point where the transport companies refuse to travel through, the cost of pipeline is far beyond a brief military intervention. The straight has been targeted before in the early 90's. It blew over. I think the same will happen here. Most of this is noise. But we all know in today's world, even noise can significantly impact oil prices. Thanks for the replies to the tanker sinking scenario they make sense. I guess it will only happen if they are pushed so far in a corner that it is the only option and that should not happen as the objective is to actually make a deal of sorts. North Korea is the example I suppose lot of sabre rattling then a meaningless deal is agreed to make everyone look good. Sunken ships, oh my! Then you send some drones or men/women from the Navy down and place explosives to collapse the ship into a pile of flat steel, or simply bombard it with enough ordinance to accomplish the same thing, or both. Place buoys until it is confirmed safe depth for passing ships over once again and carry on. Mines? They would be spotted laying them within the day/night and dealt with accordingly, with the few mines they actually succeed in placing being taken out. Does anyone really think that the men and women of the countries involved, and especially their armed forces that dedicate their entire mission to keeping the lanes open, have not thought through these scenarios and planned for them? Also, as stated by others, once Iran makes such decisions and starts to carry them out they will be bombarded back to the era that they wish to take us all to, pronto. Rodent is right, a few days and then all hell would break loose, but for Iran all hell would break loose immediately, and the oil would keep moving under heavy guard. Another point is that the heavy guard is already on-site and ready. One other thing: EVERY time through the years that the threat of oil prices becoming low comes along, the last hail Mary attempt to prevent that from happening has been to say that Iran was going to close the Hormuz. Iran knows their limitations and so do the rest of the players. Gen M Dempsey, Chairman of the Joint Chiefs of Staff, said in January 2012 that Iran "has invested in capabilities that could, in fact, for a period of time block the Strait of Hormuz." He also stated, "We've invested in capabilities to ensure that if that happens, we can defeat that. "Im sure things have changed since 2011... and Abu Musa the disputed territory which is not in Iranian waters but should be by location the property of the UAE, this territory should be acquired and used accordingly, one more American Air Craft Carrier in the Straits of Hormuz." For our part, we are comfortable that we have in the region sufficient capabilities to honor our commitments to our friends and partners, as well as the international community." In the same article, Suzanne Maloney, an Iran expert at the Brookings Institution, said, "The expectation is that the U.S. military could address any Iranian threat relatively quickly." The only part of that article that is of any real significance. James, what is your take on that piece of rock Abu Musa? Are there soldiers sitting on it? Is it a gun platform? Or is all this so much posturing, the hot air of strutters?